Autumn was intrigued by how carefully programmed the schedule was. All had to wake @ 600 hours. They were given an hour to shower, change, & prepare themselves hygienically otherwise. ’Cept for 1 ditz who oft lagged & had to be prodded by the end o’ the hour, ’cause her hair wasn’t done , most realized they weren’t going to be entering a beauty contest & spent most o’ their time chatting loudly to each other. Autumn spent most o’ her time reading. 700 hours was breakfast — the same cardboard cartons o’ cereal they had @ her school, ’long with a banana or an orange that was too much o’ a hassle to open. Autumn wished she could bring a book with her, but couldn’t, so sufficed with planning & other concerns. 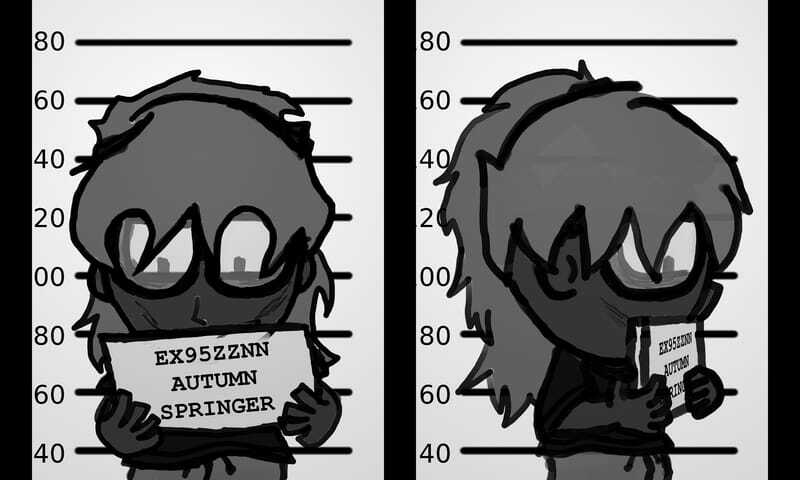 She didn’t dare e’en waste time considering robbing her jail mates, nor e’en looked @ them. When someone asked the obvious question, she always said she just tried it once out o’ desperation. Boskeopolis is an obscure city-state in the Verdazul archipelago in Orange Ocean — or, as other countries call it, the Pacific Ocean. It’s notable for its persistent violation o’ the laws o’ physics, biology, & economics — though, to be fair, real life doesn’t obey that last 1, either. As such, any inconsistencies within these stories should be blamed on glitches, for I’m ’fraid the world o’ Boskeopolis Stories is still just in beta. Within that city dwelled a perfectionist thief named Autumn Springer, who — with her timid skeletal partner, Edgar Winters, & sometimes with his cheerful chemist friend, Dawn Summers — would go on heists & explore wild lands for treasure. That is, when she wasn’t mired in the various political, environmental, or personal calamities created by Boskeopolis’s other peculiar citizens; or wasn’t dug into domestic concerns o’ work, errands, & her relationship with Edgar; or wasn’t burdened by her own chaotic mental state. See the “Person’s Represented” section below for mo’ details ’bout the various neuroses o’ hers & many other Boskeopoleon citizens’. Boskeopolis Stories plays round with a lot o’ genres, moods, & tones, & its chronology isn’t straightforward, or e’en a single, consistent line. Don’t worry too much ’bout reading these stories in the right order — ’cept for maybe those with #’d parts, like the “DISTURBED” stories. Nor should one worry too much ’bout making sense out o’ every story; one shouldn’t have to perfectly understand a story the 1st time it’s read to enjoy it. As one can see in the archives, stories are divided into yearly “seasons,” like TV series, starting July & ending June the following year — hence why each season lists 2 years. Stories are usually published twice a month starting with season 4. Publication order is determined by many complicated whims, including fitting the tone o’ the month (wintry, cold stories published in winter)* & trying to create variety by spreading similar stories (not always successful). * Admittedly, this falls apart for people who live in the southern hemisphere & have opposite seasons. I apologize for this inconvenience. I generally aim for 5,000 - 8,000 words per story without creating padding, but I find that some stories require less or mo’. Later stories have gotten shorter, which is 1 reason I rose from 1 to 2 stories per month. Just ’bout all story & bit titles are all-caps. Imagine them being yelled by a belligerent idiot. Don’t be too turned off by them: every story also has a shorter “code name” that can be found @ the end o’ the code string that starts with “#BOSK” & is usually just ’bove the title. These are much mo’ convenient to remember, & I recommend using these when referencing stories. Every story also has a 6-character code in the middle o’ the “#BOSK” string for li’l logical reason, other than as perhaps a compact way to give misc info ’bout each story or a way to reference The Simpson’s silly episode codes*. This code comprises 4 codes, the 2nd 2 comprising 2 characters each. * Do not expect me to memorize the code to every episode or reference episodes purely by their code like some Simpson’s fans with immensely impressive memory apparently do for that 600+ episode show. The 1st code is an alphabetical letter that represents the season in which the story was published. A = 1, B = 2, etc. The 2nd code is also an alphabetical letter that represents the relative order in which the story was published within that season. For example, the “HURRY” story was the 5th story published in season 3, so its 2nd character is E.
The 3rd code is the most vague. It’s a 2-character hexadecimal # that roughly represents that story’s absolute order in terms o’ when ’twas written, independent o’ publication. For instance, though the “SHIP” story was the 1st published story, ’twas the 9th story written, so it’s code is 08 (1st value is 00, as in most hexidecimal bytes). Attentive readers will notice holes in the sequence o’ hexidecimal #s, signifying rejected stories. For example, the 1st story I wrote, way back @ the end o’ 2011, was ne’er published ( for good reason — trust me ), so 00 is ne’er used. I say this code is vague ’cause these stories weren’t written 1 after the other, but written concurrently, starting & stopping @ varying times. The fact that I wasn’t consistent in when I chose to give a code to a story — when I started the 1st draft or when I finished — or how they’re portioned — the “DISTURBED” stories all have the same code, but the “GENIE” stories have different codes — makes this e’en mo’ imprecise. The 4th code is simply the story’s absolute publication order, also represented by a 2-character hexidecimal value. Read down the codes in the archives page & see that they rise consistently from 00. Though these stories are published in a specific order, that’s not necessarily the recommended order in which to read them. For 1, season 1 is rather mediocre, so it’ll give one a bad start. Since the stories play round with chronology so much, one shouldn’t worry too much ’bout reading them in the right order, anyway, with perhaps the exception o’ reading #’d parts in the correct order ( such as the “DISTURBED,” “FELIX,” & “GENIE” stories ). If one found this site through a recommendation with specific story recommendations, feel free to read those recommended stories 1st. The “DISTURBED” series ( for those who have the patience to read a novel ). If you insist on harassing me: I’m a dirty thief who cares ’bout no one but herself. That’s approximately the extent o’ my significance — a’least within your demonstrably low standards. Red ponytail, glasses… usually wear this same black shirt that says “PHAT LOOT” & shows an ingot on it, e’en though it has holes in it. I gain nothing from telling you that, so if you’re truly curious ’bout this immensely significant “knowledge”, you can try & look that info up yourself. The story of Robin Hood; nonfiction. O, I dunno. I don’t truly do much. I try to help Autumn. I guess I try to be helpful; but I don’t know how good I am @ it, though. Then ’gain, Autumn always said that you have to do something a lot to be good @ it, so maybe I’ll be good @ it after a while. O… Um, well, I guess you know I’m a skeleton, I guess… Uh… & I wear this dark purplish robe I got from when I was in school. ( Laughs. ) Still fits, surprisingly. I don’t know why I still wear it. I guess I should probably replace it, but I don’t know what I’d replace it with, & ’sides, I kind o’ like it &, ’sides, Autumn said she kind o’ liked it, so I dunno. O, I dunno. Like I said, I kind o’ like helping people… & cooking can be kinda fun. & talking to Autumn & Dawn — & any other people, too, I guess. Um… I don’t truly have much o’ a background. I, uh, I guess I met Autumn when we were in high school. I think 10th grade, ¿maybe? It’s funny, I think we met kinda accidentally. She kinda just wanted help raising money & she helped me, uh… when ’nother student was mad @ her &… I dunno. I don’t remember how it… it went from there. I guess I’m not the most responsible person, ’less it’s truly important, like someone’s in trouble or something. I mean, I haven’t done anything truly horrible yet, like accidentally poke someone’s eyes out or something. Some people say I’m cheery to a fault — that person is Autumn, by the way — but I don’t see how there can e’er be a fault to that, so they’re obviously wrong. ¿You like my green jacket / dress thing? I got the idea from some video game hardly anyone’s probably played. It e’en comes with this cracked bat I keep in my back in case I have to fend off o’erly assertive marketers or my insecurities. I made sure to cut plenty o’ holes in it — the jacket, not the bat — so I can fit all o’ the chemicals & doodads I have on me. You have no idea how useful they can be. Cute, too. ¡Everything! ¿What couldn’t be interesting? Well, I guess watching paint dry could be kinda repetitive… but then I could just try imagining all o’ the air molecules pushing gainst the poor paint & causing all o’ the H2O molecules to be squished to death, or imagine oxygen atoms coming in & forming orgies with a bunch o’ carbon-hydrogen groups & fatty acids ( unlike a lot o’ humans, molecules don’t fat-shame ). When I’m not screwing round with chemistry that will probably cause major explosions, I like to play video games or watch movies or hang out with or woo — everyone says that no one can make pickup lines like I can, which I totally can’t understand as subtle mockery @ all — a lot o’ different people or listen to music or e’en make my own music, though it’s not very good, or e’en try making my own video games & not getting much farther than a simple chase game, & a bunch o’ other stuff I can’t remember right now. So, like I said, everything. Most o’ my life’s been spent pretending to be a hero warrior in what Autumn calls my electronic fantasies, but you probably don’t want to hear ’bout that. Actually, it’s funny: I remember running that restaurant being truly upsetting, but looking back on it now, it doesn’t look so bad & I’m actually kinda glad I did it, since it was new, & there’s always something good you can learn from new things, e’en if what you learn is to ne’er do that thing ’gain. I always have to make myself do new things ’cause there’s only so much time left ’fore you’re in the infinite chasm & I don’t want to go there without having done everything yet. But then I end up missing the ol’ stuff I’m not doing anymo’ ’cause I’m doing all this new stuff & it becomes impossible to find time for it all. ¡Augh! I guess I’m rambling ’bout irrelevant nonsense now. Sorry. I think that’s everything — everything important, a’least. ¡I, Lance Chamsby, am as any good man, an independent man who refuses to be enslaved by any, who profits purely by his own wit & grit! ¡My cloak & top hat are as black as the funds o’ a well-run business, the latter emblazoned with a golden dollar sign, the 1 sign that signifies human intelligence, self-preservation, & high standards! ¡My prime interest is myself & my work, not for the sake o’ others, but purely for the sake o’ self-expression! My background should be obvious to all: I was born to the Chamsbys, the richest family in Boskeopolis since the early 1900s. It’s awfully nice o’ you to ask me; but I’m ’fraid there’s not much to say. I don’t interact much with people, you see. But if you truly want to know, this red-orange bird mask I found in a costume shop in the middle o’ nowhere eons ago. Only cost 5₧, too. Nothing much: I just enjoy spending my free time reenacting some o’ my favorite stories from history with my tub o’ figurines. Sometimes I like to read or watch shows, too. Well, if you insist: I was formed deep in the heart o’ the Crystal Caves from calcium stalagtites by the geometrical magic o’ the Heavenly Parliament. I don’t remember hardly anything from then to now. I’m deeply sorry. Don’t let O’Beefe’s spunky attitude fool you: he’s the most serious journalist in Boskeopolis, praised all o’er for ne’er giving into the lamestream media & for standing up to the average Boskeopoleon who eats Subway™ sandwiches. That’s not to say that he’s square. When he isn’t being a journalistic ninja, he enjoys motorcycling, mountain climbing, & saving the world from meteors. O’Beefe ne’er leaves him home without ensuring that he’s impeccably dressed. You will usually find him in a fetching dark gray tweed suit with shiny white gloves & a bowtie as red as roses. His hair is always equally neat, perfectly parted in the middle. Thursday O’Beefe graduated Applewood High School in 2012, which is where he began his career as the bravest journalist in Boskeopolis. Since then he’s been putting his foot in every doorway, tirelessly seeking opportunities for serving the scrumptious truth to Boskeopoleon citizens in all corners. O, I don’t truly have a personality or anything. Well, I guess everyone says I apologize too much & that I hate myself too much. I guess they must be right, since I’m not smart ’nough to know what’s right or not. I guess I’m a cat or something, which probably ’splains why — wait, I’m not s’posed to say things like that. I don’t do anything important. You don’t want to hear ’bout that. So that I may be consummately accurate, I must confess my proclivity toward imbuing most in proximity with petulance due to my penchant toward magniloquent diction in my communication. Notwithstanding this detriment, I perennially attempt to maintain an amiable disposition, though I must additionally confess that it may be debilitated by my supplementary propensity toward disquietude. I am not confident if that is a subject for which one may discuss regarding oneself properly; howe’er, if it is imperative, I shall attempt to do my utmost in describing myself as objectively as feasible: my hair is black, with its posterior fastened into a mildy globular protuberance and the proscenium extended all along my visage; my nose has often been described by various colleagues I have had as particularly angular… Additionally, I suppose my body mass is less than that of the average human, judging by statistics, though I must assure you that this is due purely to arbitrary nature and that I harbor no insecurity in regards to my weight, though I suppose that would be the natural suspicion for most people. In regards to my apparel, it is nothing more fascinating than the average white-and-gray business suit. As for my purpose for maintaining this costume even when not currently in a professional setting, I was always instructed that how one presents oneself is how others will construe one — as somber as this is. The primary subject in which I harbor immense interest is literature and the study thereof, which is the rationale for my electing it as my major at the aforementioned university in which I attend. It is imperative that I acknowledge the lack of animation in regards to my background. My residence of origin was Birch Street, my secondary school was St. Sebastian’s Secondary School, and the university that I am attending in the present is, of course, Boskeopolis University, which I began attending in the year 2013. ( Laughs. ) Ne’er considered that prime concern, truly. Since I’m always doing lab work, e’en @ home, I usually wear your usual white lab coat. As you can see, my hair’s already graying. Other than that, I like to spend my free time reading or petting my cat, Moniz. Let’s see… I graduated from Evergreen High School in… 197…¿6? Yeah, that must be it, ’cause I received my PhD in biology — from Boskeopolis University, ’course — in 1988, which is 12 years afterward.